Our chefs have curated dining experiences that reflect a delicious variety of regional palates. These packages are available as buffet or plated banquets. Enjoy all that the plentiful coastline has to offer with this seafood- focused meal. Go for the full gourmet experience with our sumptuous surf & turf entrée, or keep it light with the flavorful trout entrée. Stuffed Button Mushroom - Fresh button mushrooms stuffed with spinach, fontina, and roasted cherry tomatoes, then broiled to melted perfection. This dish may be vegan with omission of the fontina. House Salad - Spring lettuce tossed in a hazelnut pear dressing. Topped with cucumber, grape tomato, Rogue Valley blue cheese, and dried cherries. Grilled filet drizzled with garlic béarnaise sauce, topped with marinated giant prawns. Served with potato gratin and Brussels sprouts with candied bacon. Pecan-crusted trout fillet drizzled with brown butter. Served with potato gratin and Brussels sprouts with candied bacon. islands, these meals are both sweet and fresh. 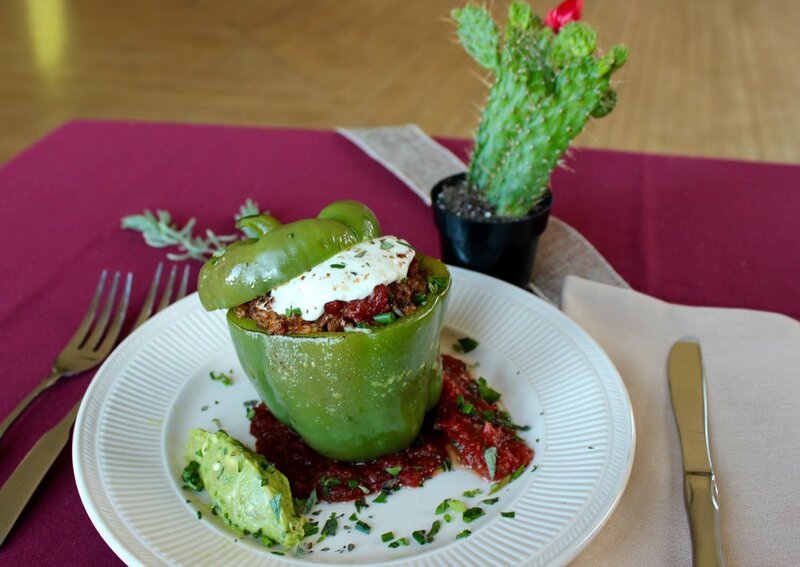 Bell peppers stuffed with ground beef, mozzarella, tomato sauce, and Spanish rice. Served with salsa and guacamole. harvest, and fresh seafood that are abundant in the Pacific Northwest. Linguine tossed in a rich champagne cream sauce with fresh fennel, garlic, white-wine-infused mushrooms, and grilled chicken breast. The hunter-style pasta dish listed above, served with brown-buttered salmon in lieu of the chicken. These dishes may be substituted for individual entrees in any of our curated dining packages.